Continuing his tour around Kenya, Newsnight correspondent Paul Mason sees how mobile phones are helping those that live beyond the big cities. June Arunga, a neo-liberal Kenyan academic and writer, hits me with the argument when I arrive to meet her at a Nairobi food market: "Why are we still trying to work out how government can provide water and health; why are we still reliant on aid - when we have a model of private sector, market-led development in the mobile industry?" The answer of course is politics. But June tells me mobile phones are having an amazing impact at a local level, even here. She says it's not obvious to visitors but there is a great deal of small-scale deference in Kenyan society. "But," she says, "the mobile allows you to walk away, it allows you to own yourself." I found out how accurate this perception was in Kibera. It's Africa's biggest slum, with about 800,000 people living in streets that are effectively composed of sewage and old shoes. I should not call it a slum, says Marcy Kadenyeka, a community organiser in Kibera for the Nairobi People's Settlement Network. When the residents of Kibera came together last year, it was the first time people from shanty-towns around Nairobi had properly linked up beyond their local issues. They came together to fight evictions. 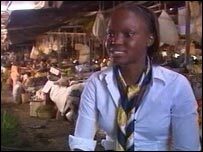 The street theatre Marcy took me to in Kibera tells the story of what usually happens. A rich guy in a white cap comes along and buys the land, then he goes to the local chief and "gives him something for his breakfast". At this point the crowd of about a thousand Kibera people watching the play burst out laughing. "And my dinner, and my supper!" says the man playing the local chief - and the laughter of the audience gets raucous. A brown envelope is slipped into the pocket of the chief, and now he calls for his askari - a big security guard with a stick. "They come at night with bulldozers," says Marcy. "They take off your door, your window frame or your roof and throw your things into the streets. That's eviction". So what the Nairobi People's Settlement Network did was use mobiles and the internet to get organised against evictions. They used what we would call flashmobbing to call people from across the many different and rival settlements together where big evictions were planned, and threatened to sit down in front of the bulldozers. It has not been completely effective, since the bulldozers simply wait a few days - but it is starting to change the dynamics of grassroots politics. 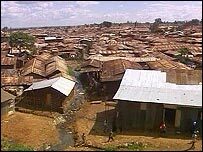 In Kibera most ordinary people can't afford mobiles instead they use the community mobile service, Simu Ya Jamii, which has been partly developed by the GSM Association, the world industry body for mobiles. Most of the activists do have mobiles and they use texting when they are out of talktime. And, says Marcy, it's breaking down the usual arrangement between movements like this and the political elite. Normally a politician arrives, promises stuff, fails to deliver and if you ask questions "you are seeing him face to face, backed by his goons," she shrugs. "Now we have information we don't have to be dependent on patronage of the politicians - we can question them and be more independent," she says. The final leg of my journey was into the Great Rift Valley where, according to my network map, the service peters out. But when we got there it didn't. The first person I met as I jumped out of the 4x4 was Lucy Ndilai, a teacher in a Masai village. Had she got a mobile? Yes. Had it made a difference to Masai society? A massive one. 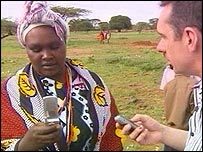 To hear her full tale you'll have to tune into my Newsnight report but, basically, Masai husbands have discovered the secrets of the "incoming calls" list - and there's been tears before bedtime. Making the journey along the mobile network was like travelling through a corridor of progress: and yes, it's facile to say mobiles are causing it all - but I don't think either economists or sociologists have yet begun to measure the massive impact they are having. The mobile phone industry worldwide is faced with the challenge of bringing the next two billion people onto the network: once that happens, and it will happen this century, the balance of world development will have tipped decisively. It will be a sign of progress but, I think now, a big contributor to it as well. The Masai kids who waved me off from their village are part of Africa's first digital generation. To the north lies the old Africa of war, poverty, flood and famine - and one technology alone will not eradicate that. But giving ordinary African people more power, and a bigger voice will - and my journey left me in no doubt about the power of the cellphone to do that. Is technology leaving you behind? Do mobile phones cost the Earth?